Had WW II continued into 1946, the IJA 30 mm Ho-155 Browning machine cannon (often mis-designated Ho-105) would have become first line anti-bomber armament in IJA fighters and interceptors. It was starting to be used in early 1945, if only on a trial basis, and gun production was well under way. The four images attached, though of varying quality, show the evolution of this gun. They are approximately to scale, and are aligned to one another on the belt feedway. The ancestry of the Ho-155 begins in 1942 with the 25 mm Ho-51 Browning (top image). This gun was intended to replace the 20 mm Ho-5, using the same airframe space for mounting if possible. The Ho-51 fired a 25 x 115 mm cartridge, very seldom seen since little development was done in 25 mm. Like its ancestors and descendants, the Ho-51 used typical Browning disintegrating link belt feed, and was developed by Chuo Kogyo K.K. in cooperation with the Third Army Aerotechnical Laboratory at Tachikawa. This gun, possibly unique, is probably now the NASM or USAF Museum. The caliber was soon expanded to 30 mm, and development of the Ho-155 around the 30 x 115 cartridge began in 1943. While a 25 mm projectile holds about 1.5 times the explosive of a 20 mm projectile of the same length, a 30 mm projectile holds 2.25 times the 20 mm, justifying the change. Of course, the heavier 30 mm projectile required more power to achieve a similar trajectory, and the Ho-155 prototype (second image from top) reflects this. 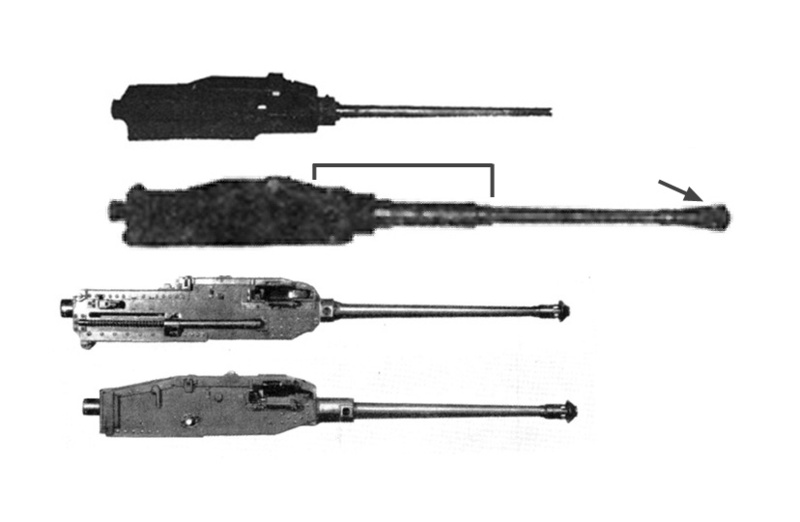 While it used the Ho-51 receiver and internals, a long and complex forward extension (bracketed in image) was added to support a heavy barrel for the larger-bore more powerful cartridge. The extra power also required a muzzle brake (indicated by arrow). This is somewhat unusual in a recoil operated gun and means the cartridge developed more power than necessary to run the gun. The prototype muzzle brake copied the "ice-cream cone" muzzle brake of the IJA 37 mm Ho-204 (Type 4) Browning. Apparently, the Ho-51 receiver and internals were inadequate to the 30 x 115 cartridge. The heavy barrel, with the receiver extension supporting it, also added a great deal of weight, undesirable in a gun to replace the Ho-5. This specimen should also be in the US. From this prototype, the Ho-155-I (second from bottom) was developed 1943-44. The gun shown is now at the USAF Museum at Wright-Paterson AFB, Ohio. It is a Ho-155-I otsu (right-hand feed), serial number 108, manufactured by Nagoya Army Arsenal in February 1945. This gun, though adequate to its cartridge, is significantly larger than the Ho-5 and Ho-51. As yet, no photographic evidence of its installation in any aircraft has been seen. Beginning in 1944, the Ho-155-II (bottom image) was developed by down sizing the Ho-155-I to fit fighter wing bays intended for the Ho-5. The result approximated the compactness of the Ho-51, but, as might be expected at this point in the war, reliability problems resulted. Nevertheless, production commenced. This specimen, also now at the USAF Museum, is marked as a Ho-155-II ko (left-hand feed), serial number 433, made at Nagoya in March 1945 . Another specimen, presently at the MOD Pattern Room, Nottingham, England, is a Ho-155-II otsu (right-hand feed), serial number 306, made at Nagoya in January 1945. It appears from these dates that the Ho-155-I and II were in simultaneous production at Nagoya. There is excellent photographic evidence of trial installation of the Ho-155-II ko in a Ki-84 wing. Famous Aircraft of the World (FAOW) Number 19 published a remarkable sequence of photos (pages 57-61), taken from late November through December 1944, showing the work done on Ki-84 number 102 (originally 8402) in installing the Ho-155 in its wings. Unfortunately, the gun is misidentified there as the Ho-3, and this has been repeated in print in several Japanese and English language sources. Comparison of the gun in the top photo, page 61, with the Ho-155-II shown here should make the error clear if the belt feed and muzzle brake do not. Aircraft photographs with the installation completed appear on page 18 of FAOW 19. The longer barrel of the starboard gun may be that originally used on the H-155-I, but the longer unsloped receiver of the I-gata probably would not have fit the Ki-84 wing section. How much use the Ho-155 actually saw during 1945 is unclear. Claims vary, but photographic and primary documentary evidence remains elusive. What this compact, powerful gun might have accomplished in combat will never be known. By the time it entered production, supplies of quality raw materials were exhausted, and it never achieved its potential reliability as a result. Nonetheless, it remains an excellent example of what could be accomplished by ingenuity and creativity applied to the basic Browning design.